I've always said that less is more when it comes to style. A basic t-shirt has always been a closet staple for me, but for some reason, I'm loving them now more than ever. I'm obsessed with all of these looks and every one of them has me inspired to dress up my favorite v-neck. Stay tuned! i love a good basic tee in black, white or gray...it's always my go-to! love all of these looks! And they're accessorized perfectly! YES!!! Have you shared your favorites & where to buy? I am in desperate need of the perfect white/grey tee! Why when I wear a tee shirt do I look like a total slob kaboob. These girls look amazing! 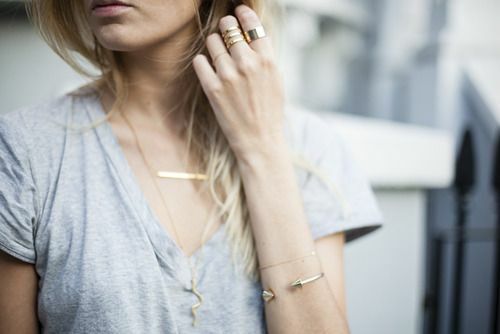 I love wearing a basic black t-shirt and accenting it with jewelry. Great way to dress up on casual days. I love these stylish basics. Great pics. I love the perfect t-shirt. It's the best in comfort and wearing the statement necklace or earrings.